On Tuesday, President Barack Obama landed in Greensboro, North Carolina, to participate in one of the most candid discussions of his presidency. A man who carried the nation on his shoulders now found himself in a room on the campus composed mainly of North Carolina A&T State University students and other invited guests. He seemed relaxed and poised, slowly unburdening himself from the cumbersome load he’s carried the past eight years as president. Stripped of his invisible cape and imaginary armor, the president was comfortable yet vulnerable as he answered questions about the importance of family, mentoring opportunities and how he handles defeat. Often, we view public officials who work to serve us as superhuman beings, pounding through life and handling their jobs armed with a thick skin and impenetrable souls. To realize that our idols — our heroes — are indeed human can be a sobering reality in and of itself. One of the first questions asked of the president focused on how he encounters defeat but is not defeated, prompted by a quote from late poet Maya Angelou in which the core values of The Undefeated are rooted. Obama couldn’t recall a time that he harbored feelings of failure during his two terms, but instead told the story of his 2000 loss to U.S. Rep. Bobby Rush in a congressional primary in which Obama, a young, not-yet-polished politician, received 31 percent of the vote. Rush received 62 percent. Obama’s stories and advice resonated, particularly with students, because it was a side of the president they were able to relate to. It wasn’t a plan on how one should live life, or even telling someone what they should be doing. It was Obama reaching out as more of a caring father figure than a political one, letting the younger generation know that sometimes it’s OK to fail. 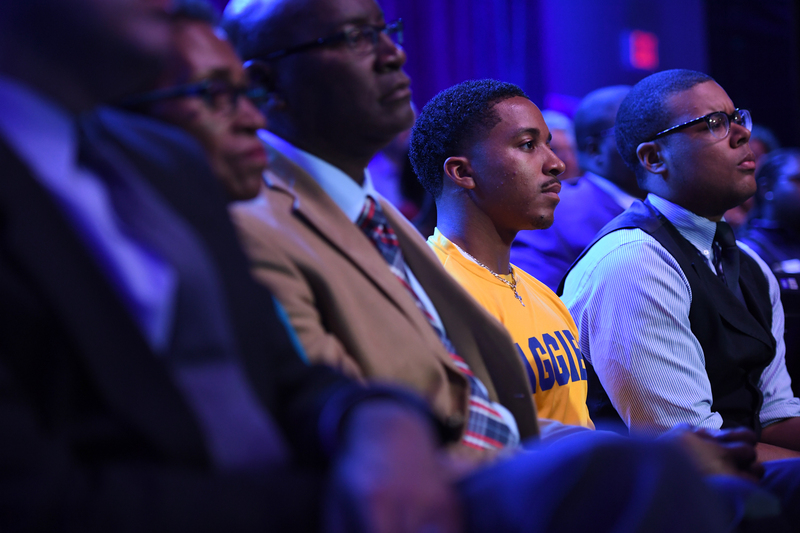 Audience members watch as ESPN’s Stan Verrett and President Barack Obama talk during ESPN’s The Undefeated: A Conversation with The President: Sports, Race and Achievement at the Alumni-Foundation Event Center on the campus of North Carolina A&T on Oct. 11, in Greensboro, North Carolina. Obama also stressed the importance of mentoring young men and boys while sharing stories about his own flawed past while growing up in Hawaii. It shed light on a different side of the president that previously appeared to be closely guarded during the earlier years of both terms. It was one of the reasons that Obama and the White House created My Brother’s Keeper (MBK), an initiative aimed to help young men and boys of color to reach their full potential. After speaking with a few young men whose lives had been positively affected by MBK’s programs, they learned the president wasn’t much different from them. After partnering with MENTOR — an organization designed to expand mentoring relationships — the program has attracted more than 25,000 mentors and has members in nearly 250 communities in the United States, District of Columbia, Puerto Rico and 19 Tribal Nations. In the two years since its launch, MBK has connected more than 250,000 sixth- and ninth-graders to mentors. Most importantly, though, he looks forward to spending more time as a father, noting that out of all the things he’s done in his lifetime and presidency, family is what will always be No. 1. In that moment, the president didn’t feel like the president at all. He had been transformed into the helpful neighbor, the overprotective yet loving father, the caring friend. He was human, and finally viewed as such. For that, Mr. President, we thank you.